Highest quality digital jukeboxes for home and commercial use, all with free delivery and installation. Visit our showroom to try them out for yourself. 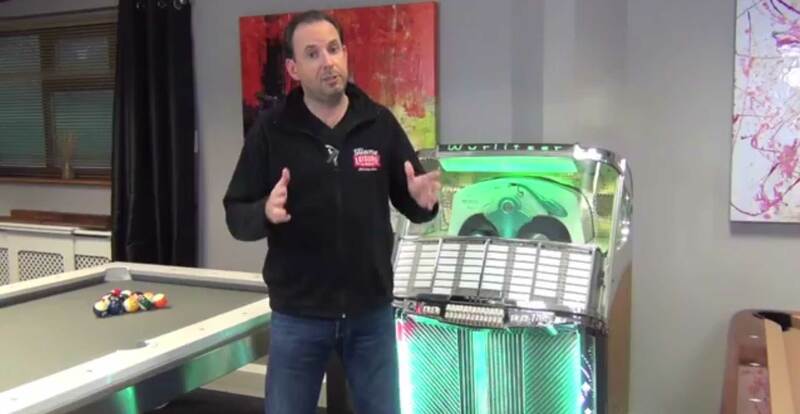 Our jukebox buyers guide takes you through the options for buying either a brand new jukebox from manufacturers such as Sound Leisure, Rock-Ola and Wurlitzer. Or you may opt to choose a vintage jukebox from the late 50s silver era to play your collection of 45s. We stock a great range of digital jukeboxes, from a variety of manufacturers, bringing these classic designs up to date while keeping the iconic style of the 20th century models. Jukeboxes have come a long way since their invention in the 1890s. They were initially used as coin operated amusements and could only play one track. They were quickly developed to a multi-track machine and, realising their commercial potential, manufacturers began to develop different eye-catching designs which would accommodate more records. Clubs, bars and cafes soon began competing against each other to acquire the brightest and most interesting designs to bring in the new young consumers of the 1940s and 50s. Manufacturers such as Wurlitzer, AMI and Rock-Ola began developing the designs we now recognise as iconic models and enjoyed a few decades of prosperity before the decline for demand in the 1960s. Now, with the current interest in vintage products and a revival in the vinyl record market, digital jukeboxes are in great demand as a way to marry old and new technology. Both companies manufacture beautiful jukeboxes with all of the charm of the retro models, but brought into the 21st century with streaming and MP3 capabilities. We are passionate about jukeboxes and love our range of digital jukeboxes. These machines cross the timeless design of a classic jukebox with state of the art technology. Our digital models allow you to upload your own music from iTunes or your CD collection, or enable you to subscribe to a pre-loaded selection of literally thousands of tracks. These digital jukeboxes are a great way to keep all of your music in one place without having to store a huge CD or vinyl collection and appeal to the current technology led generation, while still rousing the nostalgic wonder that the original machines inspire. These hand-made models are renowned for quality and reliability and are the leading models in design and technology. Often made from a single piece of wood, these cabinets are expertly crafted using traditional techniques passed down from generations of skilled craftsmen and women, making each unit as strong as it possibly could be. These fantastic machines are then adorned with aluminium, copper or chrome grills, stunning LED lighting, a digital screen and an unbeatable finish of your choice. Our staff are specialists in our range of jukeboxes and are here to advise on the best jukebox for your needs. To ask about visiting our Bristol showroom to see if we have these enchanting models in stock to view and demonstrate, please call our sales team on 0800 622 6464. All of our jukeboxes are delivered and installed as part of our service. The jukebox specialist will also run your through your new purchase and answer any questions you might have, all in the comfort of your own home. Delivery and Installation to some locations may incur additional charges due to distances involved. Please call us with your exact requirements so we can let you know what any additional charges will be for your location. This service is only available for a ground floor delivery with good access. If this is not the case, please call our expert customer service team on 0800 622 6464 and we will quote you a price. We understand with busy schedules, family life and work commitments not everyone can visit our showrooms. If you are unsure about any aspects of your new jukebox, just call the team who will happily help you over the phone. We will give you all the advice you need, and we will never misrepresent an item just to get a sale. You can trust us to offer you honest advice, all of the time, so that there are no unwanted surprises when your item is delivered. We believe visiting us will be the most fun showroom visit you will ever have. Whether you’re looking for a classic jukebox, a brand new digital model or one of our other fantastic games room products, we look forward to welcoming you soon with a freshly brewed cup of coffee and a truly enjoyable experience. Take our Showroom Tour to see what awaits you. Buying a jukebox can be a real investment, so let us make that easier for you. We offer Buy Now Pay Later and low interest payments (19.9% APR) on most of our jukeboxes, with no deposit to pay upfront and flexible payment terms (subject to acceptance). Please see our terms and conditions for more details. Jukebox Buying Advice - articles and videos covering a variety of jukeboxes, both old and new, highlighting the difference between various models and helping you to choose the right jukebox for you. Have Serious Fun choosing your new jukebox.